LANSING — A nonprofit that incorporated in September has spent large sums in the last weeks to tell voters in Detroit that a ballot proposal there is “awful.” But because of the way the group is wording its attacks, it can protect the identities of its donors. Detroit Jobs First, a 501(c)(4) social welfare organization, has run TV ads and a social media campaign against Proposal A, which will appear on Detroit city ballots Tuesday, Nov. 8, along with a competing proposal, Proposal B. The proposals offer Detroiters different requirements for “community benefits agreements,” which set hiring and negotiation standards for developers that want to work on large projects in the city. Rise Together Detroit, which describes itself as a “coalition of grassroots community organizations,” is supporting Proposal A. It covers projects with an expected investment of more than $15 million. Numerous labor groups and city officials are supporting Proposal B. It would cover projects with an expected investment of more than $75 million. Only one of the two proposals can become law. But it’s also possible that neither will if neither can gather enough yes votes. A guide to the proposals from WDET is available here. A ballot committee, called Committee for Community Benefits, has reported raising about $8,864 in support of Proposal A. No individual donor has given more than $500 to the committee, according to its campaign finance disclosure. Another ballot committee, Save Detroit Jobs, has reported raising $123,500 in support of Proposal B. Its large donors include Blue Cross Blue Shield of Michigan and the Michigan Regional Council of Carpenters, which each gave $25,000. Then, there’s Detroit Jobs First, the nonprofit organization that appears to be leading the anti-Proposal A campaign. It’s not registered as a ballot committee in Wayne County. Detroit Jobs First incorporated in September. Dykema attorney Alan Wilk filed the paperwork. Since then, it’s run TV ads and established a social media presence — all focused on attacking Proposal A. The Metro Times reported on Detroit Jobs First's work in October. The group’s advertisements don’t expressly tell Detroiters to vote against Proposal A — if they did the communications would definitely fall under Michigan’s campaign finance laws and would require the group to report its activities to the Wayne County clerk. “Detroit Jobs First did not and does not engage in express advocacy for or against any ballot questions or candidates for public office, and is therefore not required to be registered as a ballot committee or political action committee in Michigan,” Banks said. 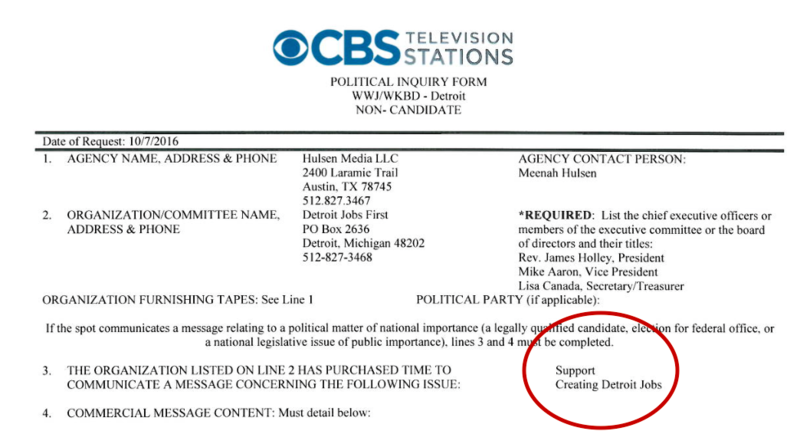 In multiple filings with the Federal Communications Commission, Detroit Jobs First listed “jobs” as the subject its TV ads concerning Proposal A were focused on. The nonprofit’s executive committee includes Lisa Canada, legislative director for the Michigan Regional Council of Carpenters, who is secretary/treasurer, and Mike Aaron, of Laborers Local 1191, who is vice president of Detroit Jobs First. Rashida Tlaib, a former state representative who’s helping lead the pro-Proposal A campaign, said it’s “extremely dangerous” that untraceable money is being used to stop a ballot proposal that came from Detroit residents. The only contributor to Detroit Jobs First that is public is the Clark Hill PAC, which disclosed a $1,000 contribution to the nonprofit in October. Along with Detroit Jobs First and Save Detroit Jobs, a Super PAC called Turn Around Wayne County is also pushing for votes against Proposal A and for Proposal B. The Super PAC spent about $276,546 in support of Warren Evans’ campaign for Wayne County executive in 2014. Now, it’s made $29,000 in in-kind contributions to Save Detroit Jobs and spent $22,565 against Proposal A, according to campaign finance disclosures. The Super PAC has received $150,000 from the Moroun family-led Central Transport this year and at least $50,000 from Powering the Economy, the Super PAC of the Detroit Regional Chamber of Commerce.